Skiing - "A Wonderful Sport"
Skiers are enjoying a run of excellent conditions throughout the Lake Placid region. 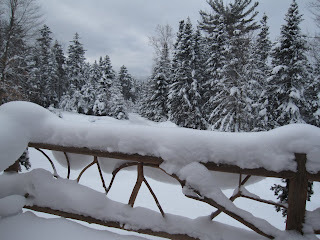 We received approximately 18 inches of snow at the homestead last weekend, and it has snowed every day since. A few inches of light, champagne powder each day makes for exquisitely sublime turns. I think some people have it bad for skiing and I might be one of them. I am relieved however, to learn this is not a new or purely modern ailment. For example, yesterday's near perfect ski reminded me of a quote from my wonderful Christmas-present book, "Two Planks And A Passion, The Dramatic History of Skiing," by Roland Huntford. This quote is from the chapter in which Huntford describes Roald Amundsen's discovery of the South Pole on 14 December 1911. Huntford notes Amundsen and his fellow Norwegians saw themselves not as explorers, but as skiers. The following quote comes from Amundsen's diary, recording his descent from the Antarctic plateau on his way home. Loose snow, so that the ski sank about 2 inches: iced and grainy so that the ski glided as if on an oiled surface. But the loose snow was also necessary so the ski could be steered. The one slope steeper than the other. We tore down like a rushing wind. A wonderful sport. Nearly 100 years later, it still is.